On many an evening, while sitting on my couch craving something sweet, this recipe has saved me. It is so, so so easy…and equally delicious. All you need is cocoa or cacao powder, coconut oil and a liquid sweetener (preferably maple syrup). If you like, add toppings like crispy rice cereal, dried fruit or nuts. You’ll never have to run to the store to satisfy that latenight chocolate craving ever again! 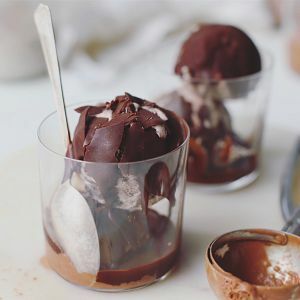 You can also use this recipe to make chocolate sauce that’s turns into a crunchy shell when poured over ice cream. Toppings such as nuts, coconut, dried fruit etc. Melt your coconut oil in the microwave or using a double broiler on the stove. Once melted, add cocoa/cacao powder and maple syrup and whisk until lump-free. 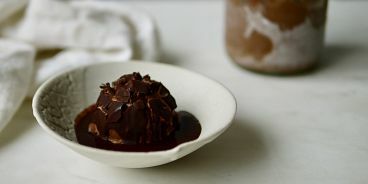 Line a baking pan with parchment paper and pour in your liquid chocolate – spread it around so it can harden in ‘bar form’. 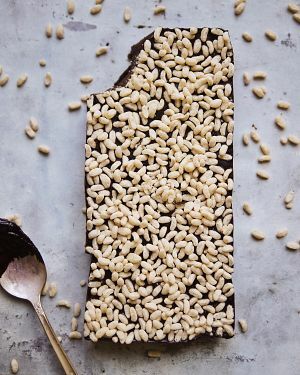 Place chocolate in the fridge or freezer until firm – enjoy! !